Today we are taking a look at a Micron 1100 series drive. This is a rather unusual review for us as the Micron 1100 series came out in May 2016 and we usually don’t review several year old products. We are making an exception this time around as the folks over at MyDigitalDiscount acquired a very large quantity of OEM excess Micron 1100 M.2 2280 SATA drives that are 512GB in capacity. They are selling them online at places like Amazon, Newegg and eBay with pricing in the $45-$60 range. That means you are looking at possibly under $0.09 per GB for one of these M.2 SATA drives and that is pretty impressive. The sequential performance of one of these 512GB drives is up to 530 MB/s read and 500 MB/s write. 4K Random Read performance is rated at up to 92,000 IOPS Read and 83,000 IOPS write. Not the highest performance number possible for a SATA drive, but these are are self-encrypting drives (SED) drives that have FIPS 140-2 validation. 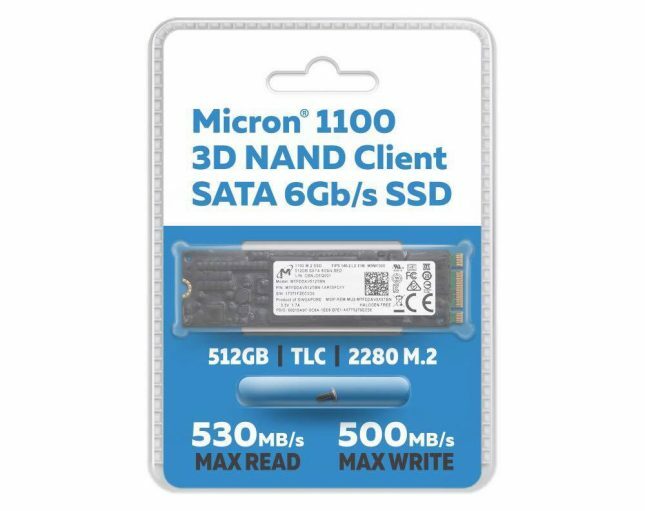 This is an option for Micron 1100 SSDs and is usually targeted at government and public sectors that require an additional level of security. The Micron 1100 512GB model has a 240 TBW endurance rating along with a 1.5 million hours Mean Time to Failure (MTTF) specification. Under the hood of this drive is a 4-channel Marvell 88SS1074 controller that is paired with Micron’s 384Gb 32-layer TLC NAND flash. This Marvell controller utilizes most current technologies and features things like dynamic write acceleration (SLC caching), partial power loss protection, static and dynamic wear leveling, active garbage collection, LDPC error correction code (ECC), adaptive thermal protection, data-path protection, and a multi-step data integrity algorithm. It also fully supports DevSleep (2.5mW), TRIM, SMART, and AES 256-bit hardware encryption. This FIPS 140-2 drive comes with TCG Opal 2.0 standards, but without Microsoft’s eDrive IEEE 1667 protocol. The Micron 1100 M.2 2280 SATA Form Factor drive has an opaque epoxy conformal coating that is applied at the factory during the manufacturing process for FIPS 140-2 compliance. This coating functions as the physical security boundary of the device. The only components exposed are the SATA Data and Power ports. 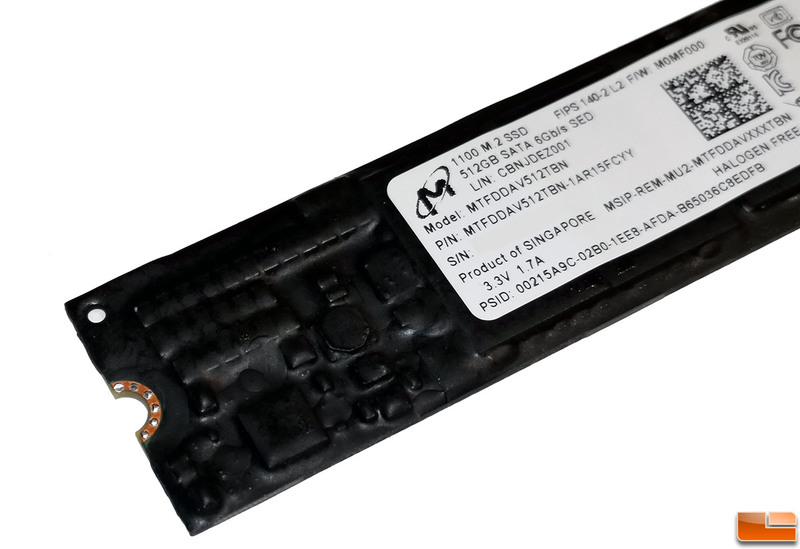 The module does not support a maintenance access interface and any tampering with the coating will be easily detected as the coating is on the top and bottom of the drive. Most consumers will never need the FIPS 140-2 compliance and this Self-Encrypting Drive (SED) will need something like McAfee Endpoint Protection for PC, WinMagic SecureDoc or Wave Self-Encrypting Drive Management to be fully secured. To comply with most data protection regulations, you or your organization has to prove encryption was in place at the time of a potential breach. This means software like this is needed. The drive does work with Micron Storage Executive Software, so you can easily manage the Micron 1100 series SSD that way. This is a single-sided M.2 drive, so no components are on the back of the drive. Let’s take a look at some benchmarks of this drive!